Until 1962, Westwood Memorial Park was a small, quiet, relatively unknown cemetery on the outskirts of Los Angeles. 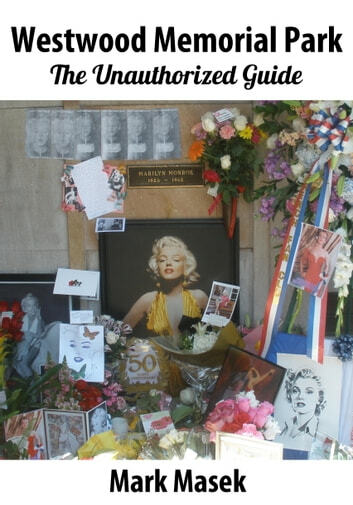 Then Marilyn Monroe was buried there, and she was quickly joined at Westwood by dozens of well-known figures from the world of entertainment. Although tiny Westwood can never replace either of the Forest Lawn cemeteries or Hollywood Forever in terms of history or the sheer number of celebrities, it has certainly become the current burial place of choice among the Hollywood elite, and it easily has more well-known names per square-foot than any other cemetery in the world. 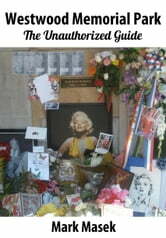 This book, “Westwood Memorial Park: The Unauthorized Guide,” provides the most complete, accurate and comprehensive directions to find the final burial locations of nearly 100 celebrities, including Monroe, Jack Lemmon, Walter Matthau, Burt Lancaster, Dean Martin, Billy Wilder, Natalie Wood, Don Knotts, Carroll O’Connor, Farrah Fawcett, Peter Falk, Janet Leigh, Jack Klugman, Karl Malden, Eddie Albert, Donna Reed, George C. Scott, Fanny Brice, Robert Stack, Jim Backus, James Coburn, Bob Crane, Merv Griffin, Rodney Dangerfield, Frank Zappa, Roy Orbison, Peggy Lee, Mel Torme and Bettie Page, and dozens more, plus detailed personal and professional biographies.